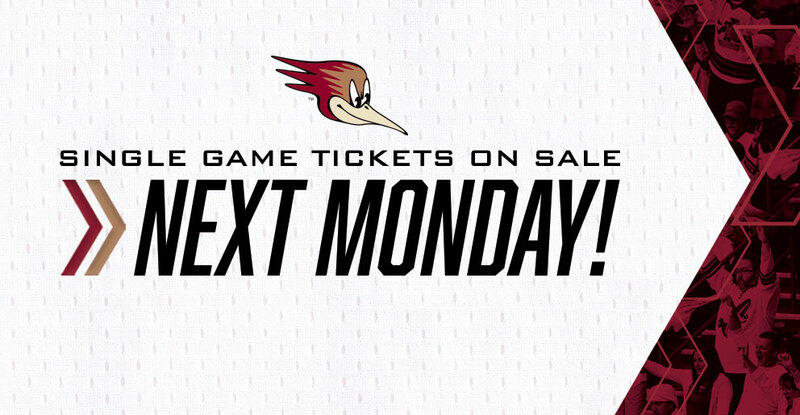 TUCSON, AZ – The Tucson Roadrunners, proud American Hockey League affiliate of the Arizona Coyotes, announced today that single game tickets for the upcoming 2018-19 season will go on sale to the general public next Monday, August 27 at 10 a.m.
Pricing for Roadrunners single game tickets for the 2018-19 season starts at only $16 and can be purchased at the Tucson Convention Center box office or online at Ticketmaster.com. Complete ticket pricing information for all single game tickets and savings on groups of 10 or more is available on TucsonRoadrunners.com. In addition, full season, half season, partial season, flex packs and the Sentinel Peak Summer Sizzler are all on sale now. All packages come at a significant savings off the gate ticket price. To purchase your ticket package today, call 866-774-6253, visit the club at 175 W Broadway Blvd or TucsonRoadrunners.com.